Achieve exciting effects with minimal effort and maximum "wow!" Pen and ink adds a whole new dimension to the loose, lovely look of watercolour. 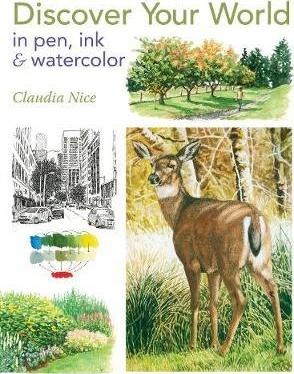 In this book, popular artists and bestselling author Claudia Nice shows you how to combine the best of both mediums, using pen and ink to turn up the texture and resonance in your paintings. Using straightforward techniques like bruising, spatter, stippling and pen blending, you'll discover an easy, expressive approach to painting. Learn how to add age to a quaint cottage. Invite viewers down a country lane. Evoke and owl's mottled feathers, the shine of fine china, the neon lights of the city, and more. Explores a multitude of favourite subjects, including country scenes, cityscapes, wildlife, skies, water and still life. Features expert advice on how and when to add pen-and-ink enhancements. Contains dozens of demonstrations and annotated paintings for fast, fun learning. Filled with the charm and passion of an artist's personal sketchbook, Discover Your World in Pen, Ink & Watercolour will inspire you to turn your everyday surroundings into fresh, heartfelt art.